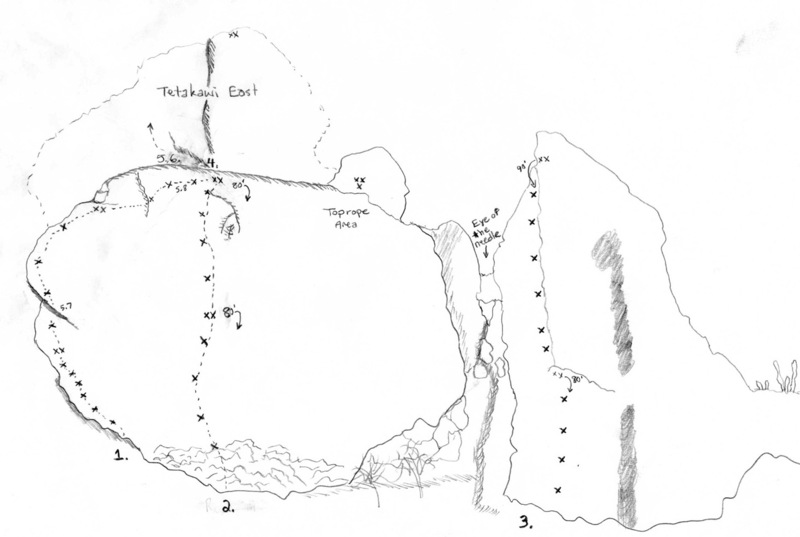 The Following (below) is a technical climbing topo for Tetakawi, the eastern mountain, north facing routes. Climbs 1 and 2 are on the milky white face visible from the pavement. #3 is to the right of the access trail right before the final scramble thru the 'needle eye'. 4,5 and 6 are on the summit pinnacle.... the 'finger' easily seen from San Carlos Main St.
From the road, park at km 15. Start hiking toward the rocky peaks and the access trail will become obvious. The hike is mildly strenuous and very steep in places. Expect loose rocky conditions. The North Face is the large flat white rock face visible from the highway. Typical hiking time to the base of the North Face is 30-50 minutes. PLEASE NOTE: All climbs on Tetakawi should be approached with caution. There are many loose rocks. Belayers should wear helmets. Always remember to pull DOWN on holds... not OUT. side of the North Face. Climber can view all of San Carlos and nearby bays. This climb offers a great feeling of high exposure. Pitch 1 (6 bolts), start at the rock cairn on the far east side of the white face, continue moving up and left. Staying as far left as possible not only improves your view, but also offers the best climbing. Pitch 2 (4 bolts), start under the small overhang and move up. This is the first crux of the climb. Continue to next belay. Pitch 3 (3bolts), this pitch is rated 5.8 and is unique because of its traverse. Get ready for small holds and creative footwork. You finish on the anchors at the top of #2. This is the best climb on Tetakawi. Enjoy! Exit this route by rappeling down #2. This fun climb is an excellent introduction to climbing Tetakawi and climbs the milky white middle of the North Face (contributing to the name). This climb was originally done as one long pitch, but was broken into 2 pitches for reduction in rope drag and rappeling simplicity. The belayer should be cautious of falling rock and flakes. Pitch 1 (4bolts), find the large broken area in the middle of the main face marked by a rock cairn. The bolts are hard to see, but look on the steep broken area for the first couple bolts to identify the climb. Move up and slightly left. The bolts are camoflagued well by the uneven surface. First bolt is at about 15'. The pitch2 belay station is on top of a large shelf about 2' wide with double anchors. run-out. The crux is right below the anchors. Stay left of the small tree and enjoy the thin climbing. The final bolt is hidden from below but sits about 5' down and slightly left of the final anchors. 2 Rappels to base. Find this climb on the rock formation to the right of the main access trail. At the base of the rock ridge, head right and down slightly. Looks for the rock cairn that marks the base. 2 pitches. Pitch 1 offers some exciting climbing that may be harder than it looks. Double bolt Belay is to the right. Pitch 2, don't touch the tree or you are cheating!. Enjoy challenging face climbing past the first bolt into the corner system above. Climb thru the caves and keep an eye out for the bolts as they are well camoflaged by the uneven surfaces. Final anchors are up over the lip, on top. Walk off around the top very carefully, or 2 rappels to base. Access this climb by finishing the hike to the top, thru the needle, then up to the left on the final finger summit. It is the obvious crack line right up the middle. First ascent unknown. New rappel bolts are at the top for safe descent. 1 pitch. Traditional gear climbing, no bolts. The first 10' or so is harder than it looks. Have your belayer spot you. Requires an assortment of gear. Be careful of placements as the rock is crumbly. Enjoy the best views on the Sea of Cortez from the top! Rappel from top. Be careful pulling your rope. The flaky rock face is like velco. 2 pitches. The base of this climb shares the same start as the crack. Pitch 1 (5.7+): Find the horizontal bolt line under the small roof and move up and left. The start is harder than it looks. Around the corner (out of view from the belay) is a tree and bolt above the tree. Its a very short pitch, but recommended to belay there for rope drag. Pitch 2 (5.5)moves up the gully to the top of the pinnacle. Its a bit of a scramble. Anchors at the top. Rappel back down close to the crack line. 2 pitches (5.7+). The base of this climb shares the same start as the crack and #5. Pitch 1: Find the horizontal bolt line under the small roof and move up and left. The start is harder than it looks. Around the corner (out of view from the belay) is a tree and bolt above the tree. Its a very short pitch, but recommended to belay there for rope drag. Pitch 2 (5.6) moves up and to the right from the tree. Look to the smooth face for bolts. This section is only 5.6, but quite fun. Bolts above the face are hard to see because of the broken rock. Be careful not to pull loose rocks onto your belayer. Is there a hiking trail that goes to to top of tetakawi, that you do not need ropes? What other hiking trails are in the area? Tetakawi has two peaks. The most popular one to hike up is the eastern peak and it does have a fairly well established trail. The trail leaves the road almost exactly from kilometer marker 15. Park there, start hiking up, the trail will be come obvious. Now that trail is not a serviced trail maintained by any agency. So its rough, and often a little overgrown. The top few hundred meters is a bit of a scramble on loose rocks and dirt. So don't wear tennies with no socks and short-shorts and expect not to get scraped a little. I wouldn't consider this hike dangerous, but you can slip and get some scrapes. You cannot get all the way to the tippy-top without technical climbing gear. But the views from the top of the hike once you step thru the needle's eye are some of the best on Earth. The western peak can also be hiked up, but the trail is much less defined and its alot more rigorous hiking. You would park at or above the Piedras Pintas beach. From the beach, you look up to the peak and can view a little 4x4 road with a dead-end.... driveable if you have a high-clearance vehicle. There is some class 5 scrambling at its top to get all the way to the top. You climb thru a couple windows carved in the rock which is very cool for the bold and adventurous. Technical climbing gear may not be needed, but the climb to the top should be taken seriously and can be dangerous. Stick to the eastern peak for a nice safe hike with a view. Heading to San Carlos in a couple weeks and want to climb these climbs. How is the condition of them? Rock is always a bit crumbly up there. You'll see what I mean when you get there. Pull down, not out when in question. Bolts and anchors are as solid as ever. Plan to be sweaty by the time you get up to the actual technical climbing. I actually pack a spare shirt so I don't have to climb soaking wet. Lower bolts on a couple of the lower face routes can be hard to spot, but they're there. I'll be in San Carlos thru most of June if you're interested in a partner up there. You can PM me. I attached a fun picture of the final pitch on Dulcinea (my favorite climb in the area). Id like to climb with you. Ive been climbing for a number of years. I have lots of gear, including trad gear (although Im not much of a trad climber). I live in SC fulltime and would like to hit up these routes with you. Call or email if your interested. Im a 5.7 - 5.9 kinda guy. Havent lead much in the past couple years. I dont have anyone to climb with so im always just setting up gear for my kids (8 and 9). This is fantastic! So there are actual bolted, sport climbing routes on Tetakawi? If I'm reading this correctly, there is no need to place additional protection along the way? My partner and I are coming down to San Carlos this Christmas to visit my parents and would love to go climbing. We will not be able to fly down with a rope or trad gear. Would anyone be interested in climbing with a couple of solid partners between Dec 25 and Jan 3? But if you have any questions at all on the local climbing, feel free to ask! How do you get to the trail coming from the condos on more southern part of the cove?! Not sure what condos you mean exactly. There are two peaks at Tetakawi. The east peak is accessed by a trail right near the 15k mile marker. Park by the tree there, you will see the trail heading up. The west peak trail is accessed by parking on Piedras Pintas Beach. Pull off on the dirt road heading to the beach, go all the way to the end of the beach, park up against the rocks. The access trail should be easy to see and you start hiking/climbing your way up. I am assuming the 15k marker is on highway 17? Also is there any sport climbing that you don't have to hike so much to get to? My family doesn't like to hike as much as I do. Anyway my friend and I are headed out to climb Tetakawi in a bit. I am glad you guys have this forum so could find some climbing. For now, the only established climbs are on the east Tetakawi, and I've bolted one way up in Nacapule's left fork... pretty solid hike to get there too, although without the extreme vertical. My hope is for us to put some routes up in Charlie's Rock this winter. A new climbing friend is getting approval from the mayor of Guaymas (who is a friend of his). Would also like to do some in the narrow corridor between the Bahia and Tetakawi. But all that is still some months away, doesn't help you at the moment. We'll put topos online when we get the climbs established though. A big problem is dealing with all the rotten rock in the area, and then trying to figure out who 'owns' the rock and access. More locals are getting into climbing who are 'connected', so that will help with future climbing development. GW, how long is the climb from the East side? Do you think a 10 yo could make it? We've done a lot of climbing around Lake Mead in Vegas. Are you asking about the hike up to the top of the peak? Or the technical rock climbing up near the top? For the hike, yes, plenty of kids hike the trail. Shouldn't be a problem. For the climbing, depends on the skill level of the kid. Helmets would be a must though since the face has some loose stuff and a kid down below with a bare head would be no bueno. Just the hike. How long does it take? Plan on 40-60 minutes depending on your pace.Bring water.Have an adult up front to watch/listen for snakes. This is a bit out of the blue, but I am in San Carlos for the next few days and am looking for a partner to do some climbing on Tetakawi. I have all the gear we might need, and have climbed here before. Are you in the San Carlos area now and possibly interested, or do you know someone who might be? I am on a sailboat at Marina San Carlos at the moment on the end of the M dock, or will be checking email.